The contact center world is getting increasingly more complex. New technologies and communication channels are coming out every year, and customers’ and employees’ expectations are growing as fast. It can be challenging to keep pace and keep everyone happy. Now might be a good time to reevaluate the tools that you are using at your contact center and determine whether they make the lives of your customers and agents easier and better. If you’re stuck with high costs and inflexible, premise-based contact center technology, then you know that this technology will be outdated sooner rather than later. We all know the many benefits of cloud technology, such as avoiding large upfront investments and time-consuming software implementations, as well as reliability, scalability, security, instant upgrades and a faster ROI. 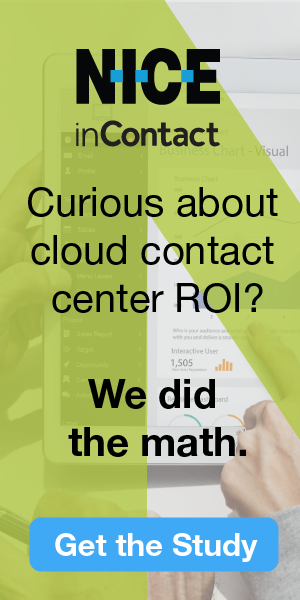 However, the real power of cloud solutions is that they allow contact centers to integrate quickly and seamlessly with different channels, APIs and new technologies to offer endless possibilities regarding personalized, unified and collaborative customer experiences. Workforce Optimization should adjust to your contact center and not the other way around. Your WFO/WFM solution should fit your environment and should integrate with the tools you have in place to unify the customer and agent experiences. It should also offer you the flexibility to choose your telephony system, contact center platform or CRM without having to change your WFO/WFM solution and retrain your team on a new solution. Gone are the days when customers were satisfied with a single channel to reach your contact center. Nowadays, they want to interact through the channel of their choice whether it’s voice, chat or email. And new channels keep coming—social media, video chat, in-app messaging, etc.—adding complexity to the seamless customer journey. The primary challenge for most contact centers is that they use different platforms to manage these channels, and data capture is difficult. You need a WFO system that integrates with multiple telephony and/or CRM systems to capture and fuse data from multiple channels to optimize your omnichannel workforce and elevate the omnichannel experience for your customers. Your agents might work from different sites or from home, and they have different needs and preferences. On top of providing flexibility in scheduling and making their requests easier, having a consistent User Interface where agents don’t have to switch between applications is a real advantage. It saves them a lot of time and provides a seamless workflow between the agent desktop and the management team. As a result, it will improve agent productivity and make them keener on delivering the best customer experience. Moreover, they will probably be willing to stick longer at your company. Having a unified cloud workforce optimization suite that was designed from the ground up to work in the cloud, and which integrates seamlessly with various telephony systems, contact center platforms and CRM will help to capture, smooth and fuse the data from multiple data sources and optimize the omnichannel customer journey. It will also provide a unified user interface that will boost your agents’ productivity and well-being while delighting your customers.